A creamy cup of coffee on a quiet and peaceful morning is just about the right start to any day in the wilderness, while a warm meal at the end of the long day is really hard to beat. Fortunately, now you can leave your cold, dehydrated and unsatisfying meals at home, and bring a whole new and inspiring level of gourmet to your camping trip. With some of the best camping stoves at your disposal, you can enhance your wilderness adventures in a way that no other tool can. The days of delicately balancing an old frying pan on a hot fire are finally gone. Today’s camping stoves are very light and have gotten more convenient over the past couple of years. Whether you are a passionate camper or just need some gear for this summer, it is very important to put some thought into what stove you will choose. Depending on your outdoor activities, you have a lot of options in the camping stoves department. They vary from small tabletop models, lightweight easy to care, to big burly freestanding behemoths for more people. Some of them are more suitable for car camping, while others are better for backpacking or day use at a picnic. That should mean that you’ll probably spend a lot less time cooking, but at the same time you pack will stay nice and light to carry. Are you looking for the very best camping stoves for you and your family? In this article, we have lined up a selection of the most highly rated camping stoves. In order for you to avoid getting an expensive product without any useful features, we are providing you with the details you need to find the best one for you. The BTU, or British Thermal Units, is extremely important when you’re looking at a camp stove. This rating tells you the amount of energy (and therefore time) it takes to heat one pound of water by one degree Fahrenheit. So if your camp stove has a BTU of 20,000 it will heat water (or anything else) faster than one with a BTU of 30,000. You want to make sure that the one you choose has enough power to cook the things you want as quickly as possible. Lower BTU is still going to get the cooking done, after all, but it’s going to take longer. In open areas, a strong wind may whip away the heat before it ever gets to your pot, which will certainly make your stove less efficient. Some kind of stoves like integrated canister stoves have better performance in windy conditions, while stoves like solid fuel stoves or wood stoves are not suitable for that condition. To avoid such inconvenience you should use a windscreen while using your stoves in nature. If you’re going to be camping for extended periods of time or if you’re going to move around a lot, you want to make sure the weight of your unit isn’t going to be too much. You need the ability to carry and store it easily and not have to worry about where you’re going to use it either. That means you need to consider not just what you can carry or where you can put it away, but also where you can set it up. If you don’t have a lot of surface space (like a table or counter) you may want a stove with legs to stand on its own. On the other hand, if you don’t have a lot of extra space you might want one that will easily fit on your table. Think about who is going with you on your trip. Remember that the first trip you’re taking with your stove may not be the same as the rest. So try to think about what the average is going to be. Are you normally going to have three people with you? Five? Seven? The number of burners on your stove will depend on the number of people you expect to be cooking for. If it’s just going to be you or you and one person then one burner may be enough. If you have seven or more, however, you might want to get three burners. The type of fuel needed to run the unit is important as well. For example, propane tanks are easy to get ahold of, easy to refill (because you just buy a refill), large in size and there’s very little waste. Plus they can be hooked up quickly and easily, and save you money on that refill cost too. On top of all that, they burn cleaner and there’s less work involved in getting it started. With all of that, you may be wondering why you’d consider anything else but there’s a very good reason. Liquid fuel works better in cold areas and it continues to work exactly the same from the moment the can is open until it runs its last drop. Propane can slow down and stop working as efficiently when it starts running low. Unfortunately, liquid fuel is messy to refill (you have to do it yourself) and it’s actually quite costly as well. Just like the grill you probably have for home, there are plenty of add-ons that you can get for a camping stove. These could range from grill plates to griddles and a whole lot more. Some options actually come with some of these features included in the box. For example, there are camping stoves that offer both burners and a grill. There are also many that you can add a grill surface to so you get that experience of grilling outdoors but on a stove that’s also easy to cook regular meals on. Make sure you consider several different options if you’re looking at an add-on grilling surface and also that you pick something that will easily fit on the grill you choose – not everything is transferable. If you don’t want to knock a cooked dinner onto the ground, you should carefully choose your next camping stove. Stoves that have a large and wide base that will rest firmly on the ground are the best option if you like to cook a large meal for a bigger group of people. We don’t say that canister stoves are a bad choice, although we suggest cooking with care because they tend to be a little less stable. Think about the tools you’re going to use for your cooking as well. If you’re going camping and you get an actual camping stove you are likely going to have no problem putting all of your normal kitchen tools, like pots and pans, on it. If you get a smaller stove, however, you may need to purchase special tools that will fit on the smaller surface. Though it shouldn’t be the number one deciding factor for which stove you choose, the price is definitely going to be important. You want to make sure that you consider what your price range is before you even get started looking at different stoves. For example, come up with a price range that you’re comfortable with, like under $100. Then you can focus your search on camping stoves that fit your budget. You’ll be able to find some that fit any criteria within any budget you have so don’t be too concerned about having a high budget in order to get what you want. The more specific you are and the pickier you are on different features the higher your budget may have to be, but if you’re just looking for a quality camping stove that will feed your entire family and friends you won’t have a problem even with a small budget. The key is just making sure you know what you want before you start looking, so you don’t fall in love with something you definitely can’t afford. In this selection of stoves, we have explained some old favorites like Camp Chef Everest, but also plenty of brand new designers in the mix. This article breaks down 8 of the best and most popular camping stoves you can find on the market. After reading this review, you will find out how they compared side by side, their prices, dimensions, their pros and cons, their ability to boil the water, resist the wind and cook in a group. Read on to find out which one best meets your expectations. Description: The Camp Chef Everest Burner Stove looks probably just like you’d expect a camp stove to, and features a slim design that has two burners so you can get the family meals going much faster. Named one of the pieces of gear you need for camping, the two burners each put out 20,000 BTU’s to make sure you’re plenty prepared for anything. Plus they don’t require a match to get started so that’s one less tool to carry and one less thing you need to do when you’re ready to start that meal. All you need to do is set the stove on a table or counter and you’re ready to light it up with the ignition switch and start cooking. Related: If you would like to have a standing version of this cooker, you can purchase the Camp Chef Sherpa Table. It’s a versatile roll-top table that you can easily transport along with your cooker. It comes with storage compartments, so you have a place to put your BBQing accessories, cutlery and dried food. What’s great about this table is that it’s adjustable, so you have control over how high you’d like the stove to be. Description: If you want a camp stove that’s really going to mimic the grill you have at home you’re in the right place with the Camp Chef Pro 90 Cooking System. It’s much larger than many other options, though it does fold down to make it easier to carry and store. To use it you just fold out the legs, stand it up and fold down the side panels to hold some of your tools while cooking. With three aluminum burners, you’ll have plenty of space to start your next meal, no matter how many people are eating with you. It has 90,000 total BTU between the burners and runs on a propane tank to get you the most even heating. Related: If any standing stove, you need a carrying case. It’s simply too big to carry on your own. So, for this standing stove, you’ll want to get the Camp Chef Carry Case for three burner cookers. It’ll carry your stove and will be able to also carry all your BBQing accessories as well. It’s built to last, you won’t have to worry about it tearing or threading. Description: The Stansport Outfitters Series is designed for those who really want a lot of power and a whole lot of strength. It’s designed with three different burners, two that are actually oversized with 25,000 BTU each and one with 10,000 BTU. It’s priced moderately so just about anyone can afford it and it easily sits on any table or counter for easy cooking. The electric ignition means you don’t need matches to start it up or keep your meal cooking. This stove also has a high altitude pressure regulator for anyone who likes to camp in wilder reaches. Related: With the Stansport Outfitters Series, to have the propane canister sitting comfortably, you’ll want to use an extension hose. The Stansport Appliance-to-Tank Hose is a 5-foot hose that connects your canister to the stove. With this hose, you’re given more mobility with your propane canister and stove. Description: If you’re willing to spend just a little more money you’ll love the Camp Chef Yukon Burner Stove, which features two burners as well as its own legs to make cooking a whole lot easier. It features a three-sided wind block and uses propane and an electric ignition to get going. If you’re a little more pressed for space, either while cooking or storing, the legs can be removed to make for a smaller surface. Each of the burners uses 30,000 BTU and are made of aluminum to better retain heat while you’re cooking. Related: Since the Camp Chef Yukon Stove is larger in size, you’re going to want a carrying case. It’ll make it easier to transport and assemble when you’re camping. The Camp Chef Cover Carry Bag is a heavy-duty bag that’s custom fitted for the Camp Chef Yukon. It’s also large enough to carry your BBQ accessories inside it as well. Description: If you’re looking for a grill that’s going to be easy to use and won’t take up a whole lot of space then the Bayou Classic Double Burner is the one for you. It has two 14 inch burners that you can easily use for stockpots or any pans you want because this unit may not look like anything fancy, but it’s strong and sturdy. The legs can be raised or lowered to get you to 25 inches without needing any additional screws, bolts or tools. Plus it comes with the entire valve assembly and regulator kit and all of that is at a moderate price. Related: If you’re looking for a camping stove that stands on its own, the Bayou may interest you, however, it’s not an overly flexible stove. If you’re looking for a standing stove with removable legs, then you should consider the GasOne Standing Propane Stove. The removable legs allow you to have it self-standing or placed on a cooking surface. 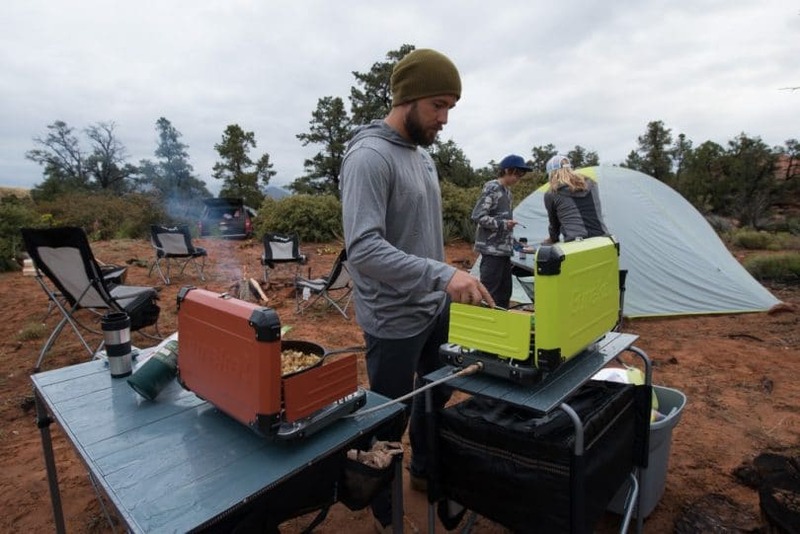 Description: The Coleman Triton Propane Stove is designed to be easy to carry no matter where you want to go or how long because it’s lightweight enough to take everywhere. Made out of steel, it’s sturdy enough for rough conditions and the two burners have enough power to make a good meal very quickly with 11,000 BTU each. The burners use Instastart technology and don’t need matches to get going and you can cook with multiple pans or even a griddle because of the removable grate. With the three-sided windshield, this unit is ready for rough conditions. Related: You don’t want your propane burner to be carried around unprotected. The best thing to use would be a carrying case. Not only does it protect the burner, but it’s a good safety feature to have especially if you have small children. The Coleman Small Stove Carrying Case is a PVC-polyester coated case that’ll protect your stove and propane bottles. Description: The GasOne GS-3800DF Brass Head Burner is designed for those who intend to go camping alone, or maybe with just one other person. It only has a single burner but with 11,000 BTU that’s strong enough to make anything you might want. It uses butane canisters for easy operation and has added safety features like a safety shut-off and governor system. It comes with its own carrying case and because it’s lightweight and small it can easily be stored even when you’re not camping. Rated to boil water faster than other stoves on the market, it’s also approved by the US & Canadian Standards Association and has a thermal plate to protect the canister. Related: GasOne is able to use any propane fuel, however, they do have their own. The GasOne Butane Fuel Canisters come in a 12-pack and are specifically designed for GasOne burners. The canister automatically reseals once it’s been disconnected from the burner and it’s also UL Listed and recognized as a safe container for butane fuel. Description: The moderate price on the Coleman Dual Fuel 2-Burner is definitely a benefit and it features two burners that run on different heating levels to make sure you don’t use more than you need. Each offers lower BTU than many of the other options, which means it’s more than enough to cook and heat food quickly. It uses either Coleman proprietary fuel or unleaded gas and has no problem with storage because it’s small and lightweight. It’s also made in the United States and features a three-sided windshield to keep it going no matter what the conditions are outside. Related: You may be a fan of Coleman products, so if you want to stick with them, we understand. The Coleman Sportster is an all-season burner that’s a great option if you want something more compact and easy to travel with. It is a single burner, with high flame it lasts up to 2 hours with constant use. Just consider that before you chose your camping stove, you should first decide what you will be using it for. From personal experience, we suggest avoiding the bigger dual propane stoves for longer destinations and stick with the single tank portable version instead. However, if you are planning a camping to a local lake with a number of people, then you should definitely invest in a larger stove. Overall, you definitely won’t go wrong with any of the campaign stoves we’ve listed before. All of the stoves are designed to serve their purpose quite well when it comes to cooking meal outdoors. If you have any doubts about which product to choose or you simply wish to discuss any of their features, we are always at your disposal. Leave us a question in the comment section below and we will get back to you as soon as possible!